I’ve been on a kick of writing about different automotive related affiliate programs. Two of the best programs for aftermarket parts are from Advance Auto Parts and Autozone. Those two programs pay roughly 8%. Tire Rack sells some products that overlap with the aforementioned stores, like wiper blades and brakes, but their bread and butter products are tires and wheels. I know you are shocked since the company is named Tire Rack. Tire Rack runs their affiliate program on Commission Junction. It’s apparent by looking at the terms of service that lawyers play an important role at Tire Rack. Their terms of service comes in at 17 pages long. It probably took a highly paid attorney a week to write. Here are the pertinent details of the program. 6% commission on all sales. 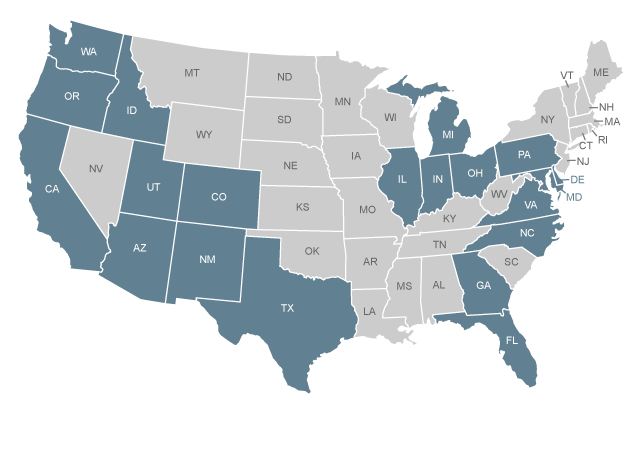 Nexus rules are big in their TOS with partners from Arkansas, California, Illinois, Iowa, Kansas, Maine, Minnesota, Missouri, New York, North Carolina, Pennsylvania, Rhode Island, and Virgina explicitly banned. Average order value of $400 (I am surprised this number isn’t a little higher given the product mix). They are oddly selective about who they work with. My application was declined and they don’t appear to be part of Viglink either. Of course, they work with Retailmenot. I also see them listed on loyalty sites, like Mr. Rebates. Daniel Gersey is listed as the affiliate contact. They appear to manage the program in-house since affiliates@tirerack.com is listed as the contact address. Based upon Daniel’s Linkedin page, he appears to be making a career of it, having been at Tire Rack for 11.5 years. He is listed as the Online Media Buyer. The program as listed at the highest 5 bar earning level with an EPC (earnings per 100 clicks) average of over $70 for both the 7 day and 3 month average. Tire Rack was founded in 1979 and is based in Southbend, Indiana. As a geographic reference point, this is the same Southbend where the University of Notre Dame is located. The company has an impressive 4.5 star rating with 51 reviews on Yelp. Their sales model is different than most companies that sell tires. The customer orders the tires over the Internet and uses an independent installer. Obviously, the model works for them as they have over 150 employees. Employees have a favorable opinion of working for the company on Glassdoor. With 10 reviews, it receives a 3.5 star rating. Since the company is privately held and somewhat secretive, financial details are hard to find. There is, however, a fascinating write up from USA Today. TireBuyer.com is the strongest competing affiliate program to Tire Rack. They pay the same 6% commission rate and advertise a similar AOV. Their claimed EPC is a whipping $139. I’ve found myself on a kick of writing about auto parts affiliate programs. For reference, you can find my article on the Advance Auto Parts Affiliate Program here and the Autozone Affiliate Program here. Today I’m going to write about the JC Whitney Affiliate Program. JC Whitney is one of the oldest auto parts retailers. The company was founded in 1915 as a scrap metal yard in Chicago. Headquarters were moved to LaSalle, Illinois in the 1990s. A private equity firm named The Riverside Company purchase JC Whintey in 2002. The main property was combined with CarParts.com, StylinTrucks.com, and AllBikeSupershop.com to create the Whitney Automotive Group in 2007. The group was purchased by US Auto Parts in 2010. As you can see, there are many sister sites that are part of the larger parent company. Partners have the choice of working with JC Whitney through Link Connector or Commission Junction. It looks like it is better to join through CJ because the commission rate is listed as 8%-10% as opposed to the 8% rate listed on Link Connector. It’s also interesting that the official affiliate page on the JC Whitney site only missions the Commission Juntion program. I suspect this has to do with how much larger CJ is. When I look at the JC Whitney program stats in CJ, I can see that it is a four bar (high earning) program. The EPC (earnings per 100 clicks) tends to be in the $15 range. This latter number is on the low side unless they don’t work with coupon sites that tend to skew all the numbers. I tested this by searching for “JC Whitney Coupon” and clicking on one of the links. The resolved link has affiliate tracking on it, so they work with coupon sites through their affiliate program. Whenever you see revenue tiers like this, the merchant is referencing earnings in a given month. 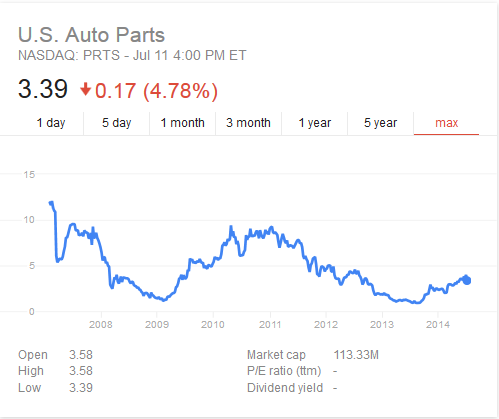 U.S. Auto Parts, owner of JC Whitney, is a publicly traded stock, but just barely. The stock was trading under a dollar a share during parts of July 2013. Fortunately, it has rebounded in 2014 and now trades at $3.39 a share for a market cap of 113 million dollars. Considering the Whitney Automative Group sold for 27.5 million, the U.S. Auto Parts group is substantially larger than the former company. When compared to the likes of Autozone, Advance Auto Parts, O’Reilly Automotive, Inc, JC Whitney is a much, much smaller company. It would be far easier for them to teeter to the brink than any of the aforementioned multi-billion dollar companies. Autozone is one of the largest car parts retailers in the United States with over 5,200 brick and mortar stores and a market cap over 17 billion dollars. The Autozone affiliate program began operating on the Commission Junction network in December of 2009. They run my second favorite auto parts affiliate program next to Advance Auto Parts. I like this latter company more because their discount strategy is more coupon focused. The earnings potential with Autozone is still substantial. EPC (earnings per 100 clicks) has stayed consistent over the last three months. Amongst all affiliate, they pay an average of 25 cents per click. Keep in mind publishers like Retailmenot skew this average and also take commissions from more niche focused affiliates by swooping in at the last minute to capture the brand + coupon searches to earn a share of sales that were going to take place with or without their existence. The referral period was increased 50% from the original 30 days mentioned on their affiliate page to the 45 day length in the current program terms. It’s always nice to have the longest referral period possible. As an affiliate junky and lover of cashback, I am always curious how much of their commissions cashback sites are passing to the consumer. In the case of Autozone, there are a handful of sites passing on nearly their entire commission value. If you are looking for a good cashback site to use, I recommend looking at Mr. Rebates. Autozone does not display contact information for their affiliate manager within Commission Junction. This is a good indication that the affiliate program is on the relative back burner in terms of their overall ecommerce strategy. It appears that they manage the program internally. If i had to go out on a limb, I would say that Mitch Walden is the program contact. 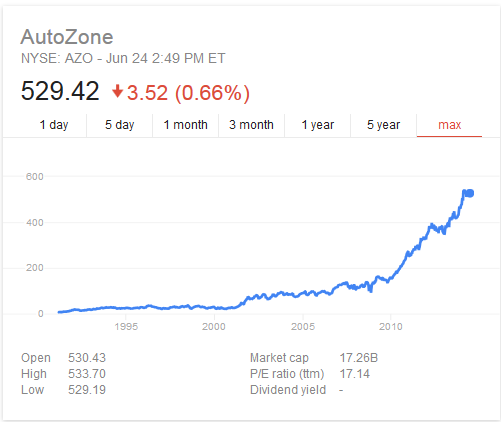 Autozone is a relatively young company given their size. The first store wasn’t opened until 1979. They are headquartered in Memphis, Tennessee. The company has seen tremendous growth both in its stock price and in terms of revenue over the last few years. Shares that could have been purchased for less than $100 in 2008 are now worth more than five times that amount. Price to earnings is at around 17. This number is less concerning than the price to earnings ratio of 22 for Advance Auto Parts. Of course it could also mean that the prognosticators are expecting more growth for the latter. Either way, this would have been a great stock to own in recent times. You can find more information about the Autozone Affiliate Program here. Advance Auto Parts runs one of the most generous and lenient affiliate programs in the auto parts industry. They operate their affiliate program on the Commission Junction network. You can register here. The base commission rate for the Advance Auto Parts Affiliate Program is 8%. Performance incentives increase this rate to 9% for sales over $10,000 in a month and to 10% for sales over $20,000 per month. A referral period of 30 days is granted between when the affiliate link is clicked and the cookie expires. The affiliate program has the highest 5 bar network earnings rank in Commission Junction. This isn’t terribly surprising from a multibillion dollar company. The EPC (earnings per 100 clicks) has ranges from $31 when looking at a 3 month average to over $40 when looking at the 7 day average. Said another way, the average affiliate is earning more than 30 cents per click when using the Advance Auto Parts Affiliate Program. Jon Kendall is the manager currently assigned to this account. His Linkedin profile indicates he has a wealth of affiliate marketing experience. I never realized the margins were so rich in the auto parts industry until I saw this level of discounting. $40 off $110 equates to over 36% off if you could nail the order value at exactly $110. If you slap the highest commission rate of 10% on that, they are discounting up to 46%, which is fairly remarkable. I can only assume that the lifetime value of an auto parts customer is quite high. After all, most of us will drive for the majority of our lives. Advance Auto Parts was founded in 1932 and now has over 4,000 brick and mortar locations. The company generates roughly 6 billion dollars in revenue with the assistance of over 55,000 employees. AAP is the stock symbol. Price to earning is at a seemingly inflated rate of almost 23, resulting in a market cap of 9.5 billion. Even more impressively, they trade for roughly 5 times the October 24, 2008 price of $25.91. All I have to say on this front is good for them. Autozone is the most logical alternative affiliate program. They also pay an 8% base rate with the program run out of Commission Junction. 5,200 locations with a market cap of 17.4 billion makes Autozone almost twice as large in valuation than Advance. 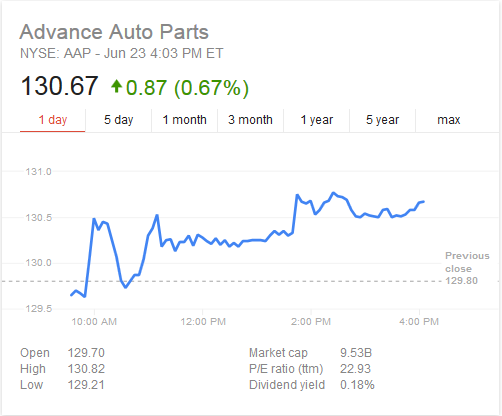 Auto Parts Warehouse also pays a base rate of 8%. They have a 10% tier for parts labeled as engine and a whopping 14% tier for parts labeled as replacement. Unfortunately, they pay nothing for over 11,000 tire and wheel products. I can’t even begin to speculate why they do this, but it does make me nervous about the program. Neither Pep Boys nor O’Reilly Automotive appear to run affiliate programs at this time.